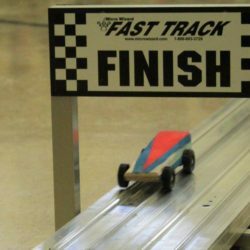 Fort Kent Cub Scout Pack 189 built and designed their own mini wooden cars which they raced on a metal track in the annual Pinewood Derby event at Fort Kent Elementary School on Saturday, Feb. 2. FORT KENT, Maine — Fort Kent Cub Scout Pack 189 built and designed their own mini wooden cars which they raced on a metal track in the annual Pinewood Derby event at Fort Kent Elementary School on Saturday, Feb. 2. 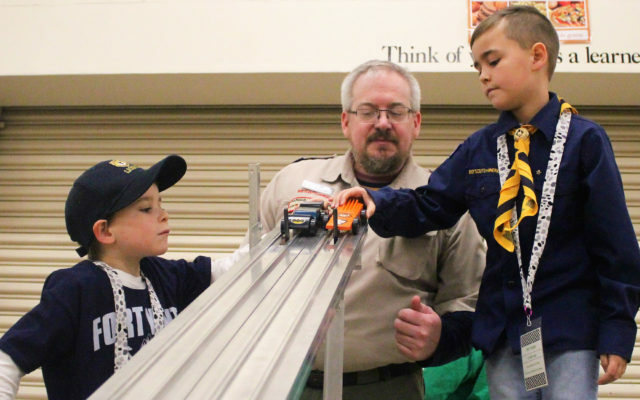 Fort Kent Cub Scout Pack 189 held their annual Pinewood Derby at Fort Kent Elementary School on Saturday, Feb. 2. 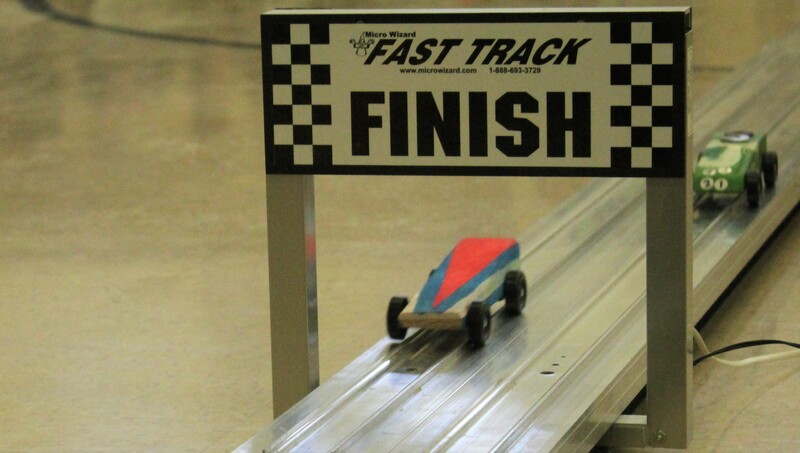 Caleb Pelletier, 9, created a slick black aerodynamic car which had the fastest race time. Pelletier’s car also won the Cub Scout Choice award, meaning that fellow pack members selected his derby car as their favorite. Pelletier described how he achieved a sleek, stylish look to his car. “To make it really slick looking, I put four coats of shiner on it,” he said. When it came to mixing colors, selecting the perfect paint for the job required some trial and error, according to Pelletier. The FKES fourth-grader, the son of John and Heather Pelletier, said he wants to be a veterinarian when he grows up. Cub Scout Greg Reischer had the second fastest car, followed by Taydem Daigle with third place, and Caleb Guy in fourth place. The following Scouts won style awards for their cars: Lucas Lozier, Best Paint Job; Cheyo Nadeau, Best Workmanship; and Nick Thomas, Most Creative. 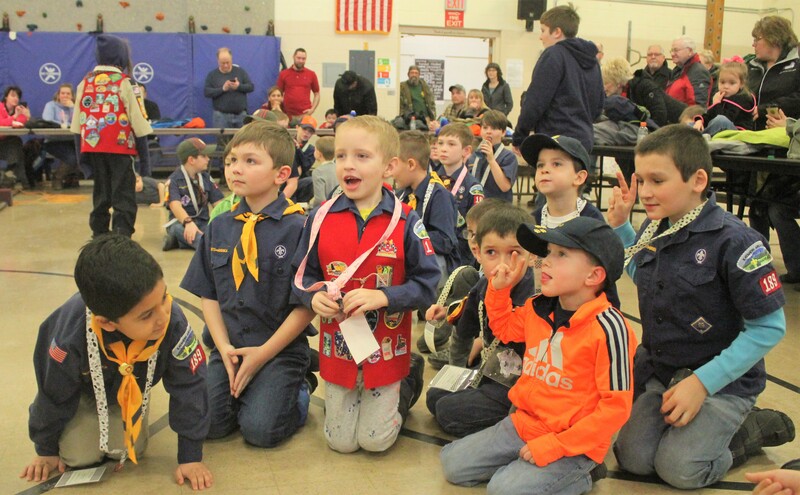 Members of Cub Scout Pack 189 in Fort Kent await the announcement of Pinewood Derby winners on Saturday, Feb. 2 at Fort Kent Elementary School.